You’ve heard the phrase time is money. A couple weeks back I told you about the Dized app to help you learn how to play board games because instructions can often take a lot of time to read and comprehend and, you know, who has time for that? This is where I have to step back and admit that I’m not the one that usually reads the directions anyhow. Our friend, Doug, is our personal trainer for many games that we play. He reads the instructions, watches how-to videos, reads forums online and gets a full-fledged grasp of the game. Then he teaches it to us. Sometimes he can set up a game, provide an overview of the rules and have us up and running in under 10 minutes. Then there are the more complex games that take so long we could have played a half dozen games of 5-Minute Chase or Escape the Curse of the Temple in the same time frame. Okay, so maybe that’s exaggerating a little, but in the case of Feudum from Odd Bird Games, it’s totally accurate. Feudum had been on all our wish lists since we came across it at Geekway last year, so Doug offered to learn and teach it. When we recently sat down to play, I lost track of how many times I thought he sounded like an infomercial pitchman. “But WAIT! That’s not all!” You might be asking why it would take so long to set up and teach a game. You also might be curious if something so daunting is actually worth the effort. The long and the short of it is this: It only takes a long time the first time around. After that, it’s quicker. Think of it like learning to drive; there’s a whole lot more to it than just turning the key in the ignition when you are first learning. After that, it’s effortless. 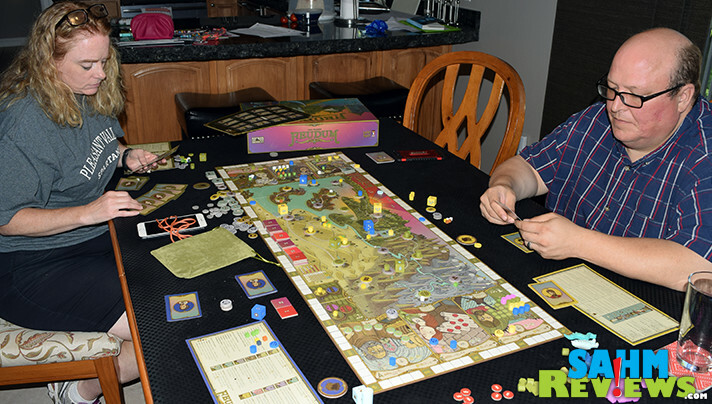 Usually when we talk about games, we tell you about the components and setup and offer an overview of the rules. That’s not going to happen here, sorry. There’s simply too much going on. So the goal of this overview is to give you a glimpse of how this game plays so you aren’t overwhelmed when you open the box and start to read the 23 page instruction booklet. When you set up the game, use a large table if at all possible because it’s not a small board. Some games utilize a board with a small footprint then require a lot of space surrounding it. That’s not the case here. In addition to the board, each player needs to have space to lay cards and store some pawns and tokens. 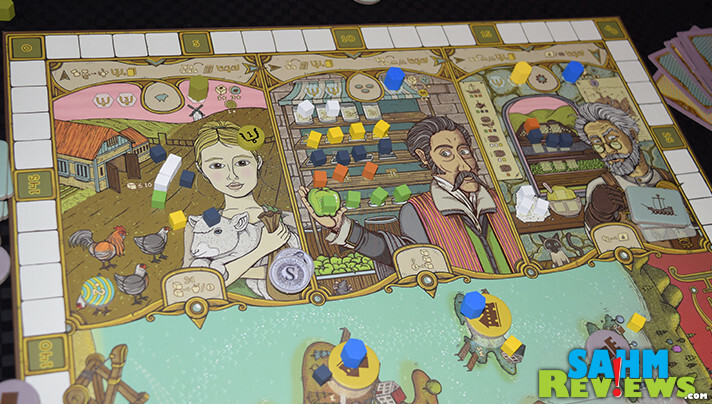 Pools of components such as location discs, vessels and money can be arranged around the board to form a general supply while cubes representing goods will go into a haversack. Starting locations are populated with discs and 24 Region/landscape tiles will be randomly placed on their spaces on the board. Players are given 3 pawns of their color, 4 player discs, 11 action cards, 7 influence markers, shillings, food, a pouch and a reference card. 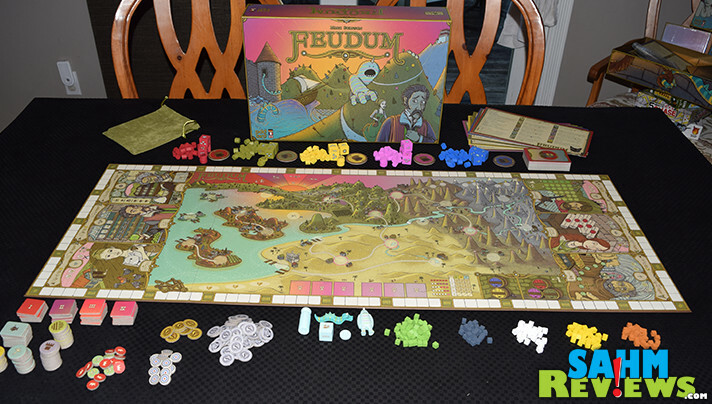 What’s a Feudum and what’s the the point of the game? Each player has 11 action cards. 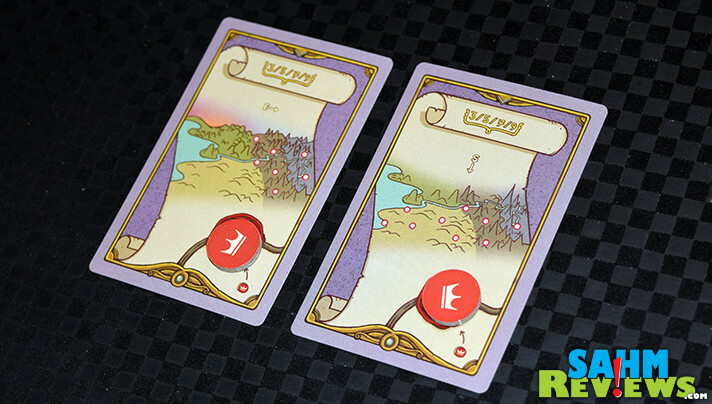 These cards are used to determine the four actions you plan to take for this round and you’ll go around the table taking turns playing them. 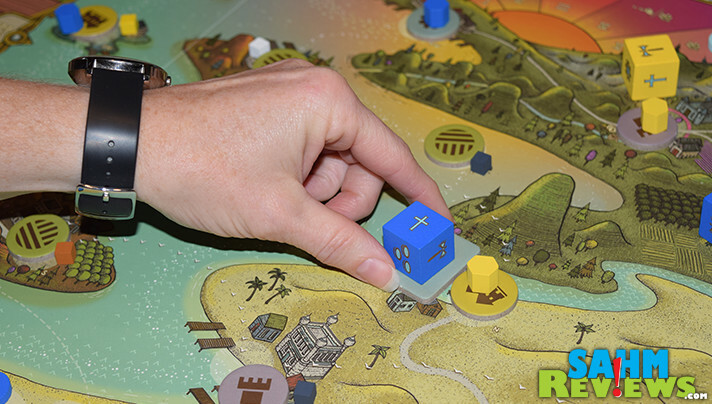 Actions range from moving around the board in order to pilfer goods, taxing, harvesting, conquering, placing influence tokens on a location or improving a location you already influence. We didn’t even get into the details about the guilds. Basically, the various actions you take give you credibility with the appropriate guild. The highest ranking player is the guild master and the second is the journeyman. Not only are these positions a source for victory points, when someone chooses to take a guild action, a portion of the fee goes to each of these other players. The guild master is able to push resources out of their guild while a journeyman pulls resources into the guild. You may want to perform a particular action, but if there aren’t resources within the guild to take, then you’re kind of out of luck. As you make improvements, you’ll get to draw a region tile and score accordingly. At the end of each round, the progress die is rolled and one of the region tiles is removed at random. This is one of the many ways that the game throws a wrench in your strategy. After the progress die is rolled, various victory points are determined and awarded, the starting player changes and the Epoch marker is checked for progress. When the 5th Epoch is triggered, the game is almost over. Well, it’s almost over on the table, but it won’t be over in your head. 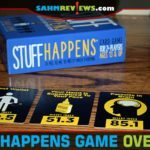 There’s so much happening and so many “I should have” thoughts that you’ll want to get it to the table again! Did I mention yet that there are end-game scoring options also? There are. See what I meant when I said there’s a lot going on here? 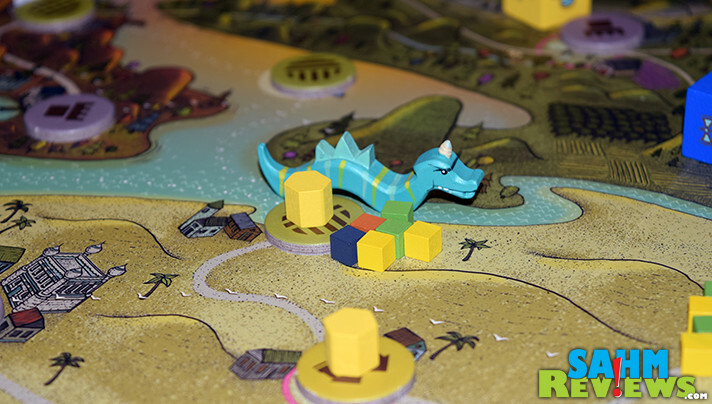 This is truly only a glimpse of all the things happening in Feudum. When we first sat down for the marathon training session with Doug, I thought it was going to be overwhelming. It was a lot to take in, but it gets quicker with each subsequent trip to the table. As if that wasn’t enough, there are a variety of expansions that add even more depth including one that adds an additional player to the mix. If you’re looking for a game with a lot of meat to it, Feudum is worth checking out. Learn more about it on the Odd Bird website or see what people are saying about it on Instagram, Twitter and Facebook. You can pick up a copy of the base game on Amazon as well as some of the expansions. Just don’t get discouraged when the first time through it takes longer to learn. It’s worth the investment in time to get this one to the table. Have you ever given up on a game because you thought it might be overwhelming? I have actually heard of this game before…I think it was my brother. He loves games like this and grew up in the 70s and 80s playing Dungeon and Dragons…and still does! Next time we visit him at home, we will have to see if he wants to teach us! 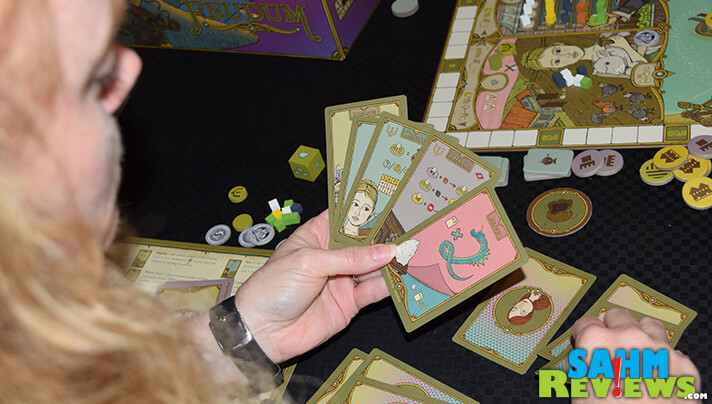 I am not even sure how to say Feudum, what a fun game idea. I am all about those strategy type games. 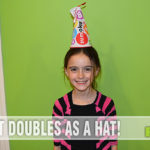 This would be a fun family night game here with my kiddos! This is similar to a game we played years ago. I can’t seem to think of the name. Anyway, it’d be fun playing this game and making some new memories. Feudum sounds like an interesting game. I haven’t been playing games with the family as much as I’d like but hopefully we can get back into it now that the colder weather is approaching. This looks like a fun one for a game night. This sounds like fun! I wonder if my kids are old enough to enjoy this type of game. Would be fun for when we go camping! 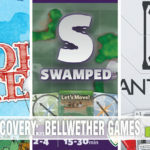 I saw this game in my friend’s house who a massive board game geek and it seemed interesting. Looking at how you described it, looks like it’s World of Warcraft and Magic: The Gathering mixed together in a board game. I’ve always seen this and passed over it without looking at how it actually played. No idea why, because now I’m completely keen to give it a shot! Sounds like a challenging game, but once you master it, it’s nice to know that there are expansion packs to enlarge the experience. So much such in the box looks overwhelming but this article helps so much, thanks. I gave up on chess…too many things to think about. I just didn’t have the patience to persist against all that information. Wow… seems kinda complicated… I want to try it! This does seem overwhelming. It looks like it could be awesome!…but probably only by the second or third gaming attempt. I would love to try this one! I love a good crunchy game! You definitely need a large playing surface for this one. I gave up on chess as I just couldn’t get the hang of the different movements for different pieces (especially the knights). Feudum looks complicated but I think I can handle it. The game board though large is visually attractive. This looks solid, though a little heavy! Thanks for the write up. Definitely looks the most colorful game for sure! 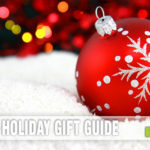 Thank you for this overview, it really helped me! 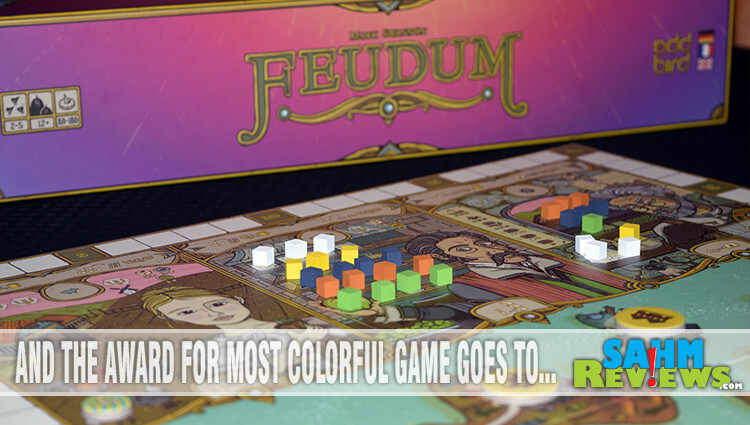 I love large, colorful, complicated games….Feudum would be perfect!